Th-INK-ing of You: ODBD For the Love of Custom Dies Blog Hop and announcement! ODBD For the Love of Custom Dies Blog Hop and announcement! ODBD For the Love of Custom Dies Blog Hop! Our Daily Bread designs has a brand new team! It's an Alumni team! Some of our past designers have returned and will be sharing special projects with you bi-monthly on Thursdays! You can read all about it on the ODBD Blog today! Meantime.... Welcome to our first Alumni Team "For the Love" Blog Hop! This week the new Alumni team along with some of the ODBD designer's are featuring for the Love of ODBD Custom Dies! Visit each link and leave a comment. One of the posts is a hot spot and a name will be drawn from that list of comments to win a $15 ODBD store gift certificate. So, all you have to do is hop along and see all the creations and leave a little love! You have until February 1st at 6 pm eastern. Winner will be announced February 2nd! So, enjoy the hop and all the inspiration using ODBD Custom Dies! If you got here from Lori's fantastic Blog, you are in the right place! If not, just pop on over to the ODBD Blog for the entire list with links! I know you're anxious to keep hopping, so I'll send you along to Dawn's blog to see her yummy creation! Stunning card, Grace! I love the soft papers and the gorgeous ribbon and rose! Beautiful butterfly and bling trail! Grace, your card literally takes my breath away - what a beautiful creations! Thanks for sharing!!! Phenomenal card, Grace....I love the "shabby chic" look...I'm a sucker for that every time, lol! Just beautiful! So beautiful, Grace! layout, design, papers... gorgeous!! What a stunning Shabby Chic design, Grace!! I just love the dp and your placement of the butterfly and details. Sheer elegance my friend!! So, so beautiful Grace! I love this design...colors, bow, pearls...perfect! It's so very nice to be back with you and the ODBD girls! Gorgeous, Grace! Amazing details! Such elegance. Wonderful design and papers! Beautifully done, Grace! Wonderful blend of colors, patterns, details, and design! Lovely card! Borgeous card with such a stunning bow and flower, this must be a card that gets a special hand delivery! Oh Grace!! This card is absolutely fantastic!! I love the colors and the vintage look to it!! Beautiful May Arts ribbon and details!! Ahhh...I'm in awe of this gorgeous card! You are so talented with putting together fabulous papers! This is Gorgeous Grace! Love this set, one of my fav. That design paper is lovely and love the flower on the bow, so elegant. Gorgeous, Grace! Love the dp patterns and the soft colors are wonderful. Your corsage and butterfly are just stunning. Just amazing work! Just love these colors together and the way those pearls come down off of your butterfly, lovely. Papers and lace edges, WOW - I envy the person lucky enough to receive this for their birthday! Gorgeous, such pretty papers especially the butterfly and lovely trail with the pearls! I am almost speechless with the beauty of this card. It is beyond gorgeous. The papers, the die cuts, the layers, the colors, the layout. You get the picture? - I love everything about it! As always, you have made a beautiful card! So feminine and elegant. Thanks! Love the colors too! grace... this card is the absolute definition of perfection! Just beautiful Grace! Love everything about it! All those die cuts, and it's not too much! Your colors are pretty together too! What a beauty Grace, beautiful dsp, and I love how you incorporated your butterfly to match, love that croched die, and such a beauty of a bow!! Stunning card, Grace! I love all the gorgeous details! So soft and elegant! Everything about this card says gorgeous. Wow, how beautiful is this?! I love the soft colors and all the lovely dies. The bow/flower combo is gorgeous, and I LOVE how the little pearls sweep down from the butterfly. Stunning! Butterflies are my favorite, and I love the way you stamped it on patterend paper. Shabby Chic at it's finest!!! So many beautiful accents, perfect colours and the borders and butterfly are beautiful!!! Stunning card as always Grace!!! So very pretty Grace! I love the lacey die and the butterfly is so lovely! And I adore how you wrapped that pearl flourish around the central panel! Yummy! Lush and gorgeous, Grace--so pretty! Such a beauty! 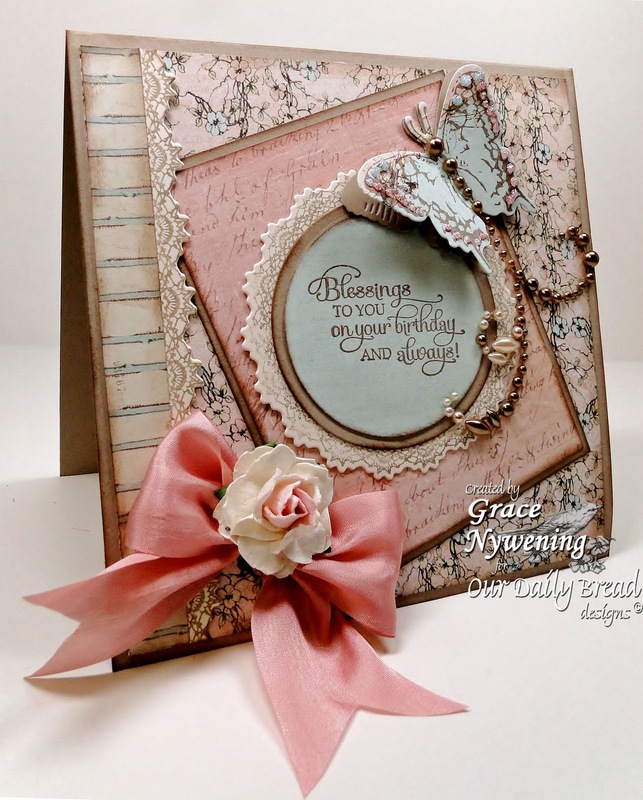 Love the papers you chose, that gorgeous flower & bow and of course the dies! WOW! Grace, this is beyond gorgeous, girl! What a spectacular design. The details you added are beautiful. Love all the texture, that fabulous die and, of course, the wonderful sentiment. I use IPhoto to edit my photographs. The software came with my Mac. I also used 'Photoshop Elements 6' to remove the color cast and feather the edges. After seeing your amazing photo, I need to take a class from you! pretty pretty colors and I really do love those lace dies! Grace your card is just lovely, the die cuts and stamp with the fabulous coloring all just gorgeous. Simply gorgeous card. I love the light airy softness of the lace dies. Coupled with your soft color choices, this is a fabulous card. Stunning card, Grace. Love the mix of colors and touches of lace look with the stamps and dies you used. Grace without a doubt you have done it again. You have created such a gorgeous card, thanks for the eye candy. What a beautiful card! The bow is so elegant! Love it! Very pretty card, pretty papers & layers and layout. I love that butterfly! Well, I know you know that I LOVE this card!!! Thanks for playing along!! Grace this is such a lovely, soft and feminine creation! I love all the detail. I like everything about it! A vintage delight wonderful card. As always, Grace - a gorgeous card! The dp and the color scheme is so soft. The bow and flower are perfect. I love the verticle strip that matches the round base panel. Mr Butterfly is beautiful with his long tail. Wonderful! What a pretty color combination. It is so soft and warming. Heartwarming! wow, i could spend hours just talking about this card. it is so rich in layers and details. the color co-ordination is wonderful. i like things a little askew and you have that covered in a soft and romantic way. this card is very soothing to look at. you made a materpiece not just a card. WOW! So beautiful - the design, color - love it love it. Thanks for sharing your talent with us. Soft, pretty, and oh so feminine. Absolutely love the color combo. This is a wow card for me. Love everything about it. love the softness and sentiment of this card. special. Beautiful card, loved the way you used the pearls for the butterfly flight path. Beautifully done...I like everything about this card! What a beautiful, elegant vintage card. The colors that you have selected are superb. TFS. Another beautiful card. This is amazing. The bow makes it! Very pretty and feminine card. Wow Grace!! This is amazing!! I love the pink!! The butterfly is so pretty!! It all just comes together to make a beautiful card!! Just think about it before it was just paper and a stamp and ribbon!! You made it into a beautiful card!! love the crochet die trims on this card - thank you so much for sharing Grace! This has got to be the most beautiful card I've ever seen it is so pretty and elegant just perfect in every way, stunning. Beautiful!! Love all the layers!! Love the off-center element and the layers. The color scheme is very chic and the end result is gorgeous! Love everything about this card; design, colors, embellies....everything! Gorgeous! Grace, this is absolutely amazing.I would love to be the recipient of this card. Beautiful card .. love it! very nice - I tend to make simple cards but yours makes me want to try a bit more pizazz! love the butterfly and the way that you used the pearls!!! What a stunning card, love it all. I love the vintage look of this card! Very beautiful use of the pearls and flower and I love the all the colors in the background papers and embelli's! Lovely! I love the soft tones and pearls. Wow! Stunning!! Love, love, LOVE it! Thanks for sharing! Gorgeous, Gorgeous, Gorgeous!!! What more can I say. Thank you do much for sharing your many talents w/ us today! Gorgeous card, your colors are soft and feminine. Love the soft colors on this beautiful card!! And that butterfly with it's bling is awesome! Oh Grace, you are one of my very favorite designers and this card is just one example of why. The colors and well laid out design with such coordinated care is outstanding. Thank you so much for always giving us some beautiful project to aspire to! This is a gorgeous, GORGEOUS card. I love the color combo, the papers, and the butterfly. Everything goes together so well in this card. What a great example of how God holds all things together too. Thanks for sharing! Thank you so much for sharing your gorgeous creation! WOW! Stunning doesn't even begin to describe this gorgeous card! Love it! Absolutely gorgeous!! I LOVE this card! This card looks like it stepped out of the Victorian Ages. Absolutely beautiful. Thanks. Oh do i love this card all the dies the stamps and the colors are great! and i think our cats are twins! Beautiful! This should be displayed. Very pretty especially finishing the butterfly with beading. Very beautiful! Love the combination of lace and soft colors you chose to create a vintage look! Wow this is beautiful. Love the chic look. Great way to use the stamp and dies. Love how you used the pearl with the butterfly. Nice Job. Gorgeous--love the bling on the butterfly. Great card. I like the butterfly, it is great. What utterly luxurious elegance - it's just fabulous, so feminine. Gorgeous card. Love the crocheted border and circle dies and stamps.